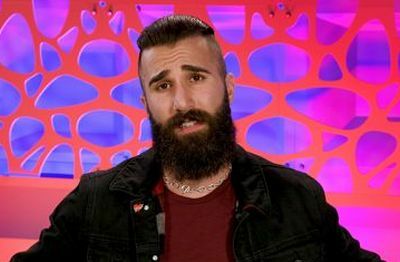 Big Brother 19 fans are up in arms over something HG Paul Abrahamian is planning to do to taunt his fellow HG Dominique Cooper. Dominique, who is African-American, is on the block and the target this week, thanks largely to Paul. Dominique has figured out that Paul was behind her being targeted and she’s been going around telling people that he’s a snake (or at least that he has snake-like tendencies). This has gotten back to Paul and he is offended that Dominique’s calling him a snake. In order to mock her, Paul told several other HGs that he planned on dressing up like a snake. The only problem? He’s decided to dress up as a black snake, so he is planning to wear all black clothing and a black moisturizing face mask. Many fans have pointed out that his plan is basically to wear blackface in order to mock the only black contestant on this season. Even if you’re willing to give him the benefit of the doubt that he’s just trying to be funny, it’s easy to see how it could be taken as racist. Adding to this idea is that, in private and unbeknownst to Paul, Dominique has been talking about how she doesn’t want to come across like the typical “angry black woman” stereotype. Dominique isn’t wrong. No African-American has ever won the game and Danielle Reyes in Season 3 is the only African-American to reach the Final 2. In fact, in the last five summer seasons, no African-American has done better than 10th place, and that was Zakiyah last season. Once Paul revealed his plan, ‘Big Brother 19’ fans hit social media to discuss their feelings about it. “He must b looking 4 a few black eyes to go with his racist costume. The real Paul. Damn shame,” one person tweeted. “On one hand, Paul doing this would be the most racist thing in #BigBrother history. On the other hand, Paul needs to be exposed. Torn,” another Twitter user wrote. “’Big Brother’ BETTER do something about Paul ’cause I’m not just gonna sit here and watch them let Paul openly be racist and humiliate Don,” an angry viewer tweeted. However, some viewers felt that Paul’s plan had nothing to do with race. “How is Paul racist? What did he do? Except play ‘Big Brother’ and got Dom nominated.. Now y’all wanna call him racist,” one person tweeted. Race has always been a very sensitive issue on ‘Big Brother.’ As viewers saw with Aaryn on Season 15, racist comments and even perceptions of racism can be very damaging outside of the house and they really leave an ugly stain on the show. For more in-depth coverage of ‘Big Brother 19,’ head on over to Buddy TV by clicking here! Watch the video below to see Paul explaining his idea to our HGs. Hey Ash, You said Dominique was the only African american person on this season…I think you forgot about Ramses. Easy to do as he’s just a floating along, but he is there! First of all this is dumb as hell on multiple levels. I do not endorse it at all. All I will say in his defense is that many of us don’t keep rattlesnake or copperhead patterned clothing around. You have to pretty much guess people are going to more likely have black clothing with which to make a costume since all green is out this summer haha lol. I am glad he stopped there and didn’t go with cottonmouth as that would have involved cottonballs yikes. I hope people bring more costume-oriented clothing in the future and no mud masks. Or just end this tired show. Paul is upset b/c Dominique exposed him as the snake he has chosen to be in the BB house. I saw the ‘black face’ to which everyone is referring on last night’s BB episode – it’s not the ‘black face’ I recall in movies of the 30’s or 40’s. Instead, it is black symbols akin to a snake’s design. Dude looks like Big Foots little Brothet. Ok, look, I cant stand the douche, but COME ON!!!!! Do we have to make every friggin thing about race!?!! I highly doubt he was/is being racist. Nobody can do anything anymore without being considered a racist. FFS, can we just get rid of him b/c hes annoying anyway, not b/c hes “racist”!? For all the people saying to relax and it isn’t racist — ask yourself if he was mocking a white contestant, would he dress up with the same blackface? Um, people mock white people ALL.THE.TIME & nothing ever happens!! Also, if he was mocking a white person, why wouldn’t he wear black face?? He’s imitating a damned snake!!! Hes not being racist! I hate Paul, so trust me, I am not sticking up for him! Im just sick n tired of all this racist bs! People are always looking for some racial undertones. I see a dork trying to dress up like a snake, not some vial racist. He said twice in the live feeds that he would be wearing “blackface”. Now, let me be clear in that I am Caucasian and I am horrified by his actions. There is NO WAY Paul can claim he didn’t know that term is offensive. Additionally, why is he dressing up as a black snake? The most common color associated with snakes is green. Hence why the snake emoji is green. You don’t think any reasonable person would have realized that dressing up as a black snake to mock an African American house guest was offensive?! Give me a break! Twenty percent think it’s hilarious? Oh dear. Well let me focus on that eighty percent! Most people aren’t dumb jerks! I saw this somewhere on Twitter and then someone said that when he said “blackface” he was talking about one of those face mask things and he was trying to decide if he should use the black one (presumably charcoal) or a green one (not sure what that one is). Either way, racist or not, he will always be a screamy douche. Yup. How could he not realize how damn stupid it is to dress up in all black to mock a black houseguest? None of the houseguests realize it either?! Give me a break. He will almost certainly NOT end up wearing the black costume, and, if he does, than that house is hands down the most vile group of guests ever to play Big Brother. It’s 2017, Paul. People are extremely sensitive to things like this. If he didn’t think people were going to be offended then he’s pretty damn stupid or he’s been living under a rock his whole life. Exactly! Black isn’t even a common color associated with snakes ? He needs to do better. There is no excuse and I’m appalled by the nasty comments on here. I read about this yesterday and am still shocked he would say something like that. I knew he was planning to dress up as a snake, and there is debate about what his “intentions” were. However, there is NO WAY he is stupid enough in 2017 to not realize the insinuation by referring to something as blackface. WTF PAUL. I really liked him but on BB, but hope he gets booted real soon now.